Each year, an annual report is published that describes the activities of the fund and the biographies of each new Budd scholarship student. The Five Year Report, assembled by Mike McCarthy, contains a history of the first five years of the scholarship fund and the scholarship students’ stories. The first group of Budd Scholars completed Form 4 in 2003. From this initial group of six students, five received grades on the national school-leaving exam (KCSE exam) that permitted them to continue with university-level education. Two were eligibile for public universities and three for private universities. Starting in 2005, the best students from each graduating class of Budd Scholars are eligible for financial support toward their university level studies. 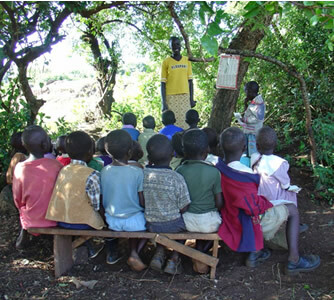 In 2005, a student in the first group of Budd Scholars started a private primary school in Western Kenya for underprivileged students. The school is named the Budd Junior Academy. It started with nursery, kindergarten and Standard 1 classes, and is adding one class each year. A Standard 1 class is pictured above. As of 2007, more than 200 students attend the Budd Junior Academy. While the Budd Scholarship Fund does not directly support the Academy, individual contributors have provided school supplies, books and financial assistance on a personal basis. Forty-three students were supported in 2007, a record number. Seventeen of these students were enrolled in post-secondary education with support from the Fund. Budd scholars continued to score exceptionally well on the secondary school examination (KCSE), with seven of the nine graduates earning A or B+ entitling them to continue to university. In addition, a former Budd Scholar, Albert Sachita Keya, became to the first Budd alumnus to contribute to the Fund. The Budd Scholarship Fund is entering its 16th year in 2015. Over its lifetime, it has directly supported 124 students from needy backgrounds with academic promise and exceptional character- optimistic and caring for others even as they face their own challenges. Once students are selected as Budd Scholars, the Budd Scholarship Fund is committed to supporting them throughout their educational career, subject to continued satisfactory performance.